IRL, he's also the ex of a singer fond of bunny ears and high ponytails. Riverdale fans will finally get to breathe a sigh of relief when the show premieres its second season on The CW. The Riverdale family will see some new faces this fall, including Mark Consuelos as Veronica’s dad Hiram, Vanessa Morgan as Toni Topaz, and Charles Melton as the new Reggie. 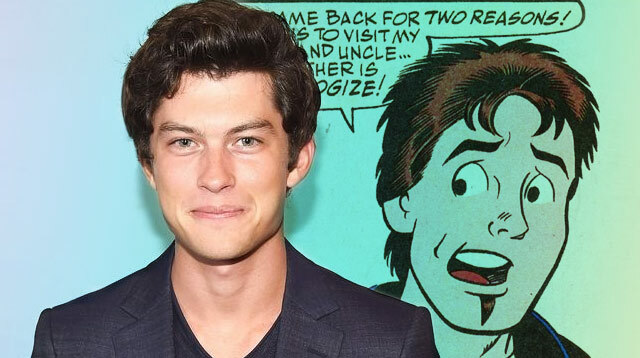 Also new in the town of maple syrup and serpents: Graham Phillips, who will be playing Veronica’s ex boyfriend Nick St. Clair in at least two episodes. As previously announced, Nick will be paying a little visit from New York and look to cause some drama between Varchie (Veronica and Archie). According to showrunner Robert Aguirre-Sacasa, Nick is “a wolf in sheep’s clothing: a hard-partying Lothario with dark desires and an unchecked sense of privilege.” Sweet! 1. You might know him from Broadway. In late 2008, Graham starred in the Broadway production of 13, a musical starring a cast of teenagers. Graham played the lead character Evan Goldman, who deals with both the aftermath of his parents’ divorce and his upcoming Bar Mitzvah. You know who else was in the musical? Ariana Grande. She was one of the cheerleaders. But you knew that already, right? 2. Graham and Ariana dated for about three years after meeting on 13. They broke up in 2011 and have remained friendly since. In 2015, he shared this video from the front row of an Ariana show in Anaheim. And in 2016, the pair had this sweet 13 reunion. 3. Graham also defend Ari during the great Donutgate of 2015. 4. He’s a pretty athletic guy. This applies to both participating and watching sports. 5. He played Julianna Margulies’ on-screen son Zach Florrick on seven seasons of The Good Wife. Other TV credits include episodes of The King of Queens, Judging Amy, Crossing Jordan, White Collar, and Secrets and Lies. He recently also joined the cast of The Pact, a comedy also starring Leslie Mann, Ike Barinholtz, and John Cena. 6a. Graham enrolled at Princeton University in 2012. In fact, he credits his Good Wife co-star for pushing him to go to school. “She went to Sarah Lawrence, and her argument was that your acting will always be best served when you have more in your arsenal,” he told People in 2016. “The more you know, the easier it is to understand people and be more empathetic. So, I don’t regret the decision at all.” He graduated with a Bachelor of Arts in History in June 2017. 6b. David Duchovny, his co-star in 2011 movie Goats, actually wrote a letter of recommendation for Graham when he applied to Princeton. 7. In 2014, he co-founded a non-profit theater company called Grind Arts Co. with fellow 13 alum and Princeton graduate Eamon Foley. 8. He’s a family guy. See? 9. One of Graham’s idols growing up was Heath Ledger.